Bellevue is an asymmetrical, part two-storey cottage, stucco, with plaster eaves brackets and bullnose verandah. 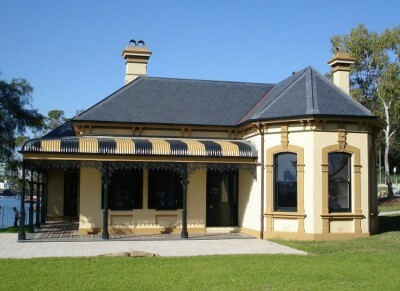 It is one of the few surviving examples of mid-late Victorian dwellings that characterised Jarrett’s Point on the Blackwattle Bay foreshore. Bellevue is reputed to have been built for Jarrett’s daughter, although the first occupant was Ewin Cecilia and J G Warden moved in a year later. Jarrett died in 1901, and it was not until 1913 that Bellevue and was sold to solicitor William Archibold Windeyer. Bellevue was used as a residence until the late 1930s and formed part of the Vanderfield and Reid Timber Yard with an adjoining building until the 1970s.Bellevue was almost “accidentally” demolished by developers until devoted locals stepped in and saved the historic site. The foreshore parkland, including Bellevue, was awarded to Leichhardt Council as a Section 94 contribution at the end of 1981 and Council re-roofed the building but it stood fenced off and neglected for many years. The City of Sydney restored Bellevue in 2007, as part of the creation of the foreshore walk. Bellevue had intricate tessellated tiling replaced, a new slate roof, traditional plaster cornices and dramatic paintwork. Bellevue now operates as a cafe and is open to the public. Definition: Stucco: A thin decorative finish applied to external masonry facades. It was extensively used in the 18th and 19th Century as an economic medium for the modelling of architectural features in lieu of stone carving, which it was often made to imitate.